Historically mysticism and spiritualism provided social bonding rites as an aide to understanding the “invisible” nature of electricity. Contact with the spirit world was a way of rationalizing the introduction and wide spread use of electric power. Homewrecker metaphorically enacts the invisible. The one-minute film loop, shot on 16mm film. uses Hitchcock's technique of uncanny manipulation of space. The female appears to be in an electronic force field and the space around her contracts and expands while she holds the viewer locked in her magnet gaze. I wanted to deal in a very primal way with the positive and negative forces of attraction and love that threaten to destabilize our lives. 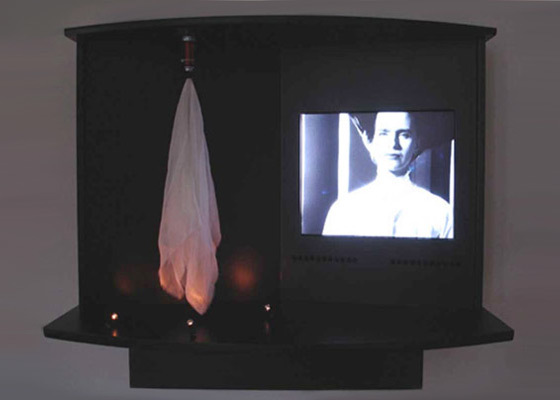 The second component, the electronic “ghost”, is an apparition held quivering in air, suspended by an invisible magnetic force.